So looking forward to this event! Delighted to be part of this exciting new venture to promote and encourage new writing in the Scottish Borders. The first event ‘In the Beginning’ will feature my ten-minute script, “Stop Procrastinating,” where Carol is sorting socks the Marie Kondo way but who or what is she trying to avoid? All welcome! Where? The County Hotel, Selkirk on Saturday 23 March at 7.30pm. Eight scripts in a night of fast action and drama, performed by local professional actors & featuring playwrights from Galashiels, Greenlaw, Hawick, Kelso, Carlops and Melrose. Not to be missed! A second-rate composer plots a terrible revenge against his god-gifted rival. Today is Gracey’s Armageddon. She must defend her territory, claim victory and ride out in a blaze of glory (kind of). The plays will be semi-staged and directed by Caitlin Skinner, founder of The Village Pub Theatre, and local director Clare Prenton. On top of all this – there will also be a raffle with lots of prizes, including cakes and plays! 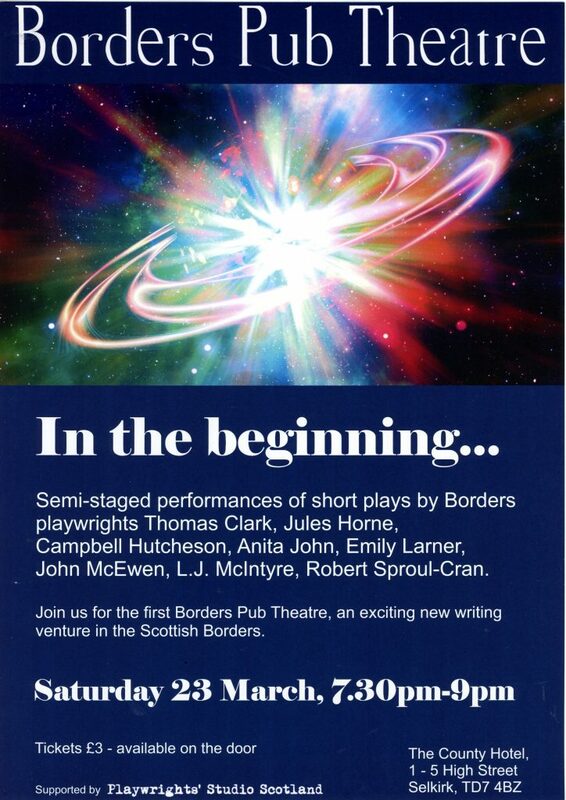 Borders Pub Theatre has been founded by playwrights who were originally part of the Scottish Borders Playwriting Programme run by Playwrights’ Studio, Scotland. Delighted to discover my poem “The Toadstone Amulet,” was chosen as Poem of the Week in the Scotsman on 20th May. I wrote this poem in response to the Scott’s Treasures Project when I researched the fascinating artefacts on view at Abbotsford House, the former home of Sir Walter Scott. The toadstone amulet immediately caught my attention – the stone was thought to grow inside a toad and was believed to protect infants from evil spirits and from being kidnapped by fairies. The poem is also included in “I’m Coming with You,” the new anthology from Scottish PEN in celebration of their ninetieth year of supporting and defending the rights of writers world-wide. Copies of the anthology can be seen and purchased here. 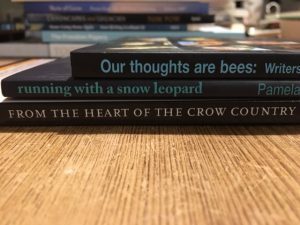 Since January 2017 I have been working as Writer in Residence for RSPB Scotland Loch Leven to help celebrate the reserve’s 50th anniversary. I’m watching the seasons change at the reserve and writing a weekly blog of my sightings and experiences which you can read under Recent Sightings here. I’m also running a number of workshops, the next one of which will be on Sunday, 19th November 2017 from 10 am to 2pm. Come and celebrate the wonders of wildlife in words at one of Scotland’s most beautiful nature reserves. We will take a tour of RSPB Loch Leven, then return indoors to capture our images in words. Open to all levels of experience. For further information and to book phone 01577 862355 or visit the reserve’s web-page here.